Aviso Ransomware is a ransomware infection that targets users in a specific location. Our security experts say that it is possible to decrypt the files affected by this infection, so this already allows us to breathe a sigh of relief. In this description, we will tell you more about the infection and how it operates. It would also be a good idea to pay attention to its distribution methods because that would help you avoid similar infections in the future. Finally, you need to remove Aviso Ransomware from your system, as the program is a dangerous threat that needs to be taken care of immediately. This program comes from the Crypt888 family, and the program’s interface is entirely in Portuguese. 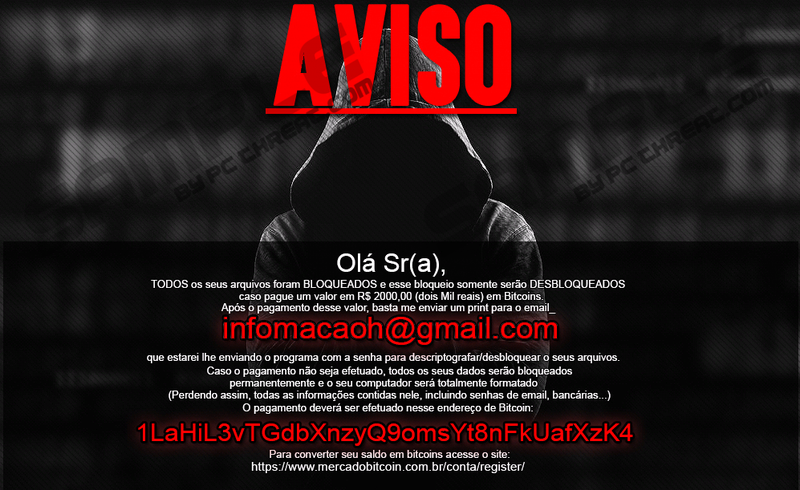 Thus, we can assume that the ransomware targets Portuguese-speaking users all over the world. We also believe that its main target is computer users in Brazil because the program expects you to pay 2000 Brazilian Real. Nevertheless, just because the program is so locally-focused, it does not mean it cannot enter your computer, too. If your email address falls into the hands of spammers, there is a very good chance you could also be included in the spam campaigns that distribute this infection. As you can probably tell, Aviso Ransomware employs the most common ransomware distribution method. The main problem with spam campaigns is that sometimes spam messages manage to get into your main inbox. Those messages can look like regular notifications from some online store or your financial institution. The point is that before you download a spam email attachment, you have to ask yourself whether it is really the real deal. Has your financial institution sent you attachments before? Do the stores you usually shop at do that? Finally, if you downloaded the attachment, you should scan it with a computer security application before you open it. The attachment may look like a simple MS Word document or a PDF file, but by opening it, you would infect your system with Aviso Ransomware. Once the infection takes place, the program makes use of the AES encryption algorithm to encrypt your files. If it were not for the publicly available AVG decryption tool, it would probably be really hard to get your files back, as the AES encryption algorithm is rather complicated. Luckily, we do not need to worry about that, so you can ignore all the other things this ransomware program shows. For instance, all the encrypted files will have the “lock” extension added to their files names. If you have a cat.jpg file on your PC, then after the encryption this file will be titled Lock.cat.jpg. Needless to say, it will be impossible to open it. When Aviso Ransomware enters your computer, the program drops its files in the %TEMP%\Sisem folder. There are three files in total. One file is a malicious executable file called Sims.exe. The second file is Sims.exe.bat. This batch file runs the malicious executable file 300 seconds after the infection is installed on your system. Finally, there is the Sims.exe.lnk shortcut file; although our security experts suggest that the file does not seem to have any important role. As mentioned, the program enters your computer with the intention to push you into paying around $620USD for the decryption key, but there is no need to do that. You can find the AVG decryption tool online, and with that, you can decrypt your files. Of course, you also have to remove Aviso Ransomware from the system because what is the use of keeping this infection on-board? You can get rid of the infection by following the instructions provided below this description. The manual ransomware removal is not too complicated, but if you do not like dealing with that on your own, you can invest in a licensed antispyware tool that will do the job for you. What’s more, if you have a powerful security application on your computer, then your system will be protected against similar threats, too. Finally, your web browsing habits are just as important in securing your system’s stability. Please refrain from downloading unfamiliar programs and opening random attachments, as by doing that you could be just a step away from a severe computer infection. Press Win+R and type %TEMP% into the open box. Click OK and delete the Sisem folder from the directory. Delete the wl.jpg image from the directory. Quick & tested solution for Aviso Ransomware removal.